Home >> >> A rewarding experience! 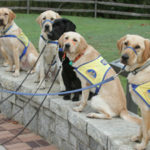 Professional training for dogs of any age from Atlanta’s most respected dog training professionals. Comprehensive Pet Therapy provides the highest quality and widest range of dog training services. Thank you for enrolling, you will be impresses by our knowledge and expertise. Please fill out this form and a CPT representative will contact you right away.